What happened to Laura’s sisters? Have you ever wondered what became of Mary, Carrie, and Grace Ingalls? We know a little about the lives of Laura’s sisters through the “Little House” book series, but what happened to them after the series ended? Wilder describes Mary’s blindness in her fifth book, By the Shores of Silver Lake, stating, “Mary and Carrie and baby Grace and Ma had all had scarlet fever..the fever had settled in Mary’s eyes, and Mary was blind” (By the Shores of Silver Lake, p. 1-2). A few years ago, new research was presented indicating that Mary may not have suffered from Scarlet Fever but a form of viral meningoencephalitis. Mary began college at the Iowa College for the Blind in November 1881. She would complete the seven year course eight years later. We are still unsure why Mary missed a year during that time. Mary learned an abundance of information while at college; according to The Ingalls Family of De Smet, some of the subjects Mary studied were Arithmetic, History, Physiology, Chemistry, Literature, Algebra, and Political Economy. Mary also became skilled in music. Laura gave Pa her $75 that she received for teaching the Perry School in order to buy Mary an organ, so she could enjoy it while she was home from college. After Mary graduated college she would return to De Smet and live with Ma and Pa at their house on 3rd Street. She helped Ma with the housework and enjoyed reading, sewing, and making bead work. Mary returned from college after her first year and brought Laura a gift of “a bracelet of blue and white beads strung on thread and woven together” (These Happy Golden Years, p. 126). After Pa died in 1902, Mary and Ma became extremely close. The two women were loved by the community but often kept to themselves. Caroline Ingalls would pass away in 1924. A couple years later Mary decided to visit her sister, Carrie, in Keystone, South Dakota, and while she was there she suffered a series of strokes and eventually passed away in 1928 at the age of 63. Mary never let her blindness keep her from doing what she wanted and lived a very fulfilling life. After graduating high school, Carrie went on to work for the De Smet Newspaper, where she learned about the printing and publishing trade. She also wrote articles and practiced the art of photography. One of the first pictures that she took was of Ma sitting in the Ingalls home parlor. It was not too much longer until Carrie became a homesteader herself. According to The Ingalls Family of De Smet, Carrie claimed land in western South Dakota near the town of Philip, SD. She lived in a small shanty and spent the required six months on the claim. She did not stay there for long, however, because she returned to the newspaper industry when she moved to Keystone, SD. It was in Keystone that Carrie met David Swanzey. He was 16 years older than her and was a widower with two children. David was looking for a wife to be a mother to his two young children. The whirlwind romance between Carrie and David lasted only 6 months before the two got married. Carrie, who was 42 at the time, would never have any children of her own. She became the stepmother to David’s two children and raised them as her own. Her husband, David, helped name Mt. Rushmore, while his son, Harold, helped build it. Carrie lived a long life. She died in 1946 at the age of 75. After graduating high school, Grace attended Redfield College in preparation to become a teacher. She followed the footsteps of Ma and her sister, Laura, and started teaching schools around the small town of Manchester, which was about 8 miles west of De Smet. While teaching she met Nathan Dow, who was 18 years older than her. The two began courting and would eventually get married in the parlor of the Ingalls Home in 1901. The couple moved to their own homestead in Manchester and became farmers. Grace and Nathan would never have any children of their own. After Ma died in 1924, Grace and Nathan moved in with Mary to care for her in De Smet. They eventually returned to their homestead once Mary left to visit Carrie in Keystone. The town of Manchester no longer stands today. It was wiped out by a tornado in 2003 and is no longer considered a town. Grace, who suffered from severe diabetes, died in 1941 at the age of 63. Her husband outlived her by 2 years. Check out our blog post about Manchester! Grace Ingalls Dow, Laura’s youngest sister, was often overlooked in the Little House book series because of her age. She was only eight years old when Laura married Almanzo in 1885. Grace would grow up and become a teacher herself, get married, and settle in the small town of Manchester, South Dakota. Once a bustling railroad town, Manchester was wiped off the map by a tornado in 2003. A few of our tour guides decided to visit the town that once was and tried to imagine what it was like when Grace lived there. 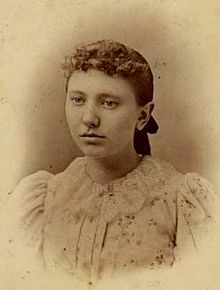 Grace Pearl Ingalls was born on May 23, 1877, in Burr Oak, Iowa. She was the final child of Charles and Caroline Ingalls. Her birth was not mentioned in the Little House books since Laura did not include the time spent in Burr Oak. Instead, Grace was already present in By the Shores of Silver Lake and took over the role that Carrie once held as the youngest child. Laura often mentioned Grace sitting on Mary’s lap, especially during the long winter. She got lost in the Big Slough when the family first settled on their homestead, which led the family in a frantic search. Grace never had a big role in the book series, but was more of a supporting character. Since many of our visitors and Little House fans are unfamiliar with Grace’s life story, this blog post will help fill in the gaps. She graduated high school in De Smet and continued her education at college. Grace followed the footsteps of her Ma and sister, Laura, and became a teacher, often teaching schools in the town of Manchester, a town 7 miles west of De Smet. It was here that she met her future husband Nathan Dow. The two got married in 1901. The ceremony took place in the parlor of the Ingalls home on third street. The couple then returned to Manchester, became farmers, and stayed there for the rest of their lives. Manchester was named after a pioneer settler. Like De Smet, it grew at a rapid pace because of the Chicago and Northwestern railroad being right beside it. Numerous buildings were built, including homes, a town hall, depot, restaurant, bank, hotel, newspaper, lumber yard, two grocery stores, two blacksmith shops, two churches, schools, a town pump, etc. Many settlers flocked to the town, hoping to take advantage of the homestead act and prove up on a piece of land they hoped one day would be theirs. Grace and Nathan settled on their own homestead about a mile from town, near Redstone Creek. Manchester is also the birthplace of Harvey Dunn, a famous painter and illustrator. He often took inspiration from his time in Manchester while creating different pieces of art. Grace Ingalls Dow died on November 10, 1941 in Manchester. By that point, the town was already struggling to keep its current residents and attract more. The Chicago and Northwester Railroad was no longer of importance. Less train traffic meant less growth. The Great Depression arrived in the 1930s, causing more residents to leave and move to other places in search of work. A once busy town eventually had a population of only 100 people. These residents were farmers that lived on the outskirts of town. On August 27, 1961, over 150,000 people arrived in Manchester to celebrate the Dakota Territory Centennial Gold rush. Entertainment included a carnival, talent show, dance, and fireworks display. During the day hundreds of contestants dug for prices, some of them worth $10,000. The event brought many well known politicians, actors, and entertainers to the area, including a young Clint Eastwood. This event was sponsored by KELOLand Television to mark the 100th anniversary of the creation of Dakota Territory. This event marked the last time that Manchester saw such a large crowd of people. By the mid 1980s, the Chicago and Northwestern Railroad abandoned the line, but eventually sold it to the Dakota, Minnesota and Eastern Railroad. In the early 2000s, only two operating businesses were left in the town of Manchester. The fate of the town would be sealed on June 24, 2003 when a F-4 category tornado made its way through the town, leaving devastation in its wake. After the tornado, the town was abandoned. A handful of residents stayed and continued to farm, but the area is now considered a ghost town. A town once full of people, hope, and excitement all but disappeared into thin air. The flagpole that belonged to the town school and the town water pump still remain. Otherwise, the town is now part of the countryside. The old dirt roads are surrounded by prairie grass. Foundations from buildings that once stood sit in decay. In 2007, a granite marker was placed to commemorate the town’s history and past residents. Grace’s married name, Dow, is one of the names listed. Although Manchester is gone, I found visiting the site of it to be peaceful and tranquil. We decided to visit during sunset, so we were able to imagine the many sunsets that Grace could see from her home. The town of Manchester may be gone, but the spirit of the town will live on for many years to come. In Wilder’s fourth book, “On the Banks of Plum Creek,” Laura describes in detail a large cloud that darkened the sky. The family assumed their crops would get much needed rain; however, it would not be rain that fell from the sky, but grasshoppers. Laura describes, “Plunk! Something hit Laura’s head and fell to the ground. She looked down and saw the largest grasshopper she had ever seen. The huge brown grasshoppers were hitting all around her, hitting her head and her face and her arms” (On the Banks of Plum Creek, 194). These grasshoppers, called Rocky Mountain Locusts, rained down on the Minnesota prairie and decimated the land. They would eat everything green in their sight, like leaves, plants, and Pa’s crops. Wilder mentioned that because of these locusts, Pa had to make the 100 mile walk back east to find work. The family was affected by the same grasshoppers the next year. According to the article, Locust, by Jeffrey Lockwood, these locusts would become mysteriously extinct in the 1870’s after a wetter climate came into affect. Jeffrey Lockwood, a science and humanities professor, wanted to solve the years long mystery of the Rocky Mountain Locusts, calling it “the quintessential ecological mystery of the North American Continent.” Lockwood goes on to explain that this breed of locust was at its greatest abundance on the Great Plains, even rivaling the bison population. He believed the dry weather caused the locusts to come baring down on farmers, sending them into a financial mess. At the time, the U.S. government decided they needed to do something about the locusts. Although they had given relief to some of the farmers affected, it was not enough. They named three men to the Entomological Commission: Charles Valentine Riley, Cyrus Thomas, and Alpheus Packard. It would be their job to gather information about the locusts, research them, and find a solution to the problem. The three men did not disappoint. They found a large sum of information regarding the locusts’ “ecology, behavior, anatomy, reproduction, and distribution of the locust, and suggested practical ways for the farmers to battle the insects” (Hopkins). The men were about to publish their findings; however, in the late 1870’s the locusts went extinct. The drought had disappeared and the locusts disappeared with it. While we may never know the true cause of the Rocky Mountain Locust’s mysterious extinction, we have a better idea of what may have happened. Like Laura’s family, these insects affected thousands of farmers and changed the course of history. Hopkins, Theodore L. “Extinction of the Rocky Mountain Locusts.” BioScience, https://academic.oup.com/bioscience/article/55/1/80/248302. Accessed 30 May 2018. Lockwood, Jeffrey. Locust, New York, Basic Books, 2004. One night in 1949, a 24-year-old woman named Maria was poised backstage, awaiting her cue. Her costume was elaborate and dramatic, which suited the passionate dancer well. Every muscle in her body felt coiled in anticipation. It was opening night, the night that would decide whether this show would make or break her career. But as the opening stirrings of Stravinsky’s Firebird sounded through the theater, Maria discovered she was not nervous. She was ready. Maria was born Elizabeth Marie Tall Chief on January 24, 1925, on a small town in Oklahoma’s Osage Native American Reservation. Born to an Osage father and a Scottish/Irish mother, both Elizabeth Marie and her sister Marjorie showed early talent in ballet. When the family moved from Oklahoma to Los Angeles, CA, Elizabeth continued her dancing studies. During this time she chose the stage name Maria Tallchief, resisting pressure from peers who thought her “Indian” last name would be a hindrance in the dancing world. Maria’s first position in a ballet company came after the outbreak of World War II, when she joined a leading New York-based touring company called the Ballet Russe de Monte Carlo. Maria quickly gained attention among ballet critics for her precise technique, her passion, and her frenetic energy. She threw everything into her performances with incredible energy and athleticism, striving to make each performance her best. She danced with several prominent ballet companies in America, catching the attention of famed choreographer George Balanchine. In addition, she became the first American to dance with the Paris Opera Ballet. In 1947, she became America’s first prima ballerina, dancing with the New York City Ballet. She worked closely with Balanchine, and he created several roles for her that would go on to become iconic representations of American ballet. These included Orpheus, Caracole, and Firebird. Despite her growing fame in the glamorous dancing worlds of New York and Paris, Maria remained proud of her Osage Native American heritage. She resisted any attempts to stereotype her or other Native Americans, and wanted to be judged solely on the basis of her talent. “Above all, I wanted to be appreciated as a prima ballerina who happened to be a Native American, never as someone who was an American Indian ballerina.” Through her efforts, Maria Tallchief’s name became synonymous with American ballet during the mid-twentieth century. Maria continued to dance with the New York City Ballet until her retirement from the stage in 1965. Soon after she moved to Chicago, where she created a lasting impression on the Chicago ballet scene through her teaching. She founded a ballet school known as the Lyric Opera in 1974, and in 1981 she began a six-year run as the artistic director of the Chicago City Ballet. In 1996, Maria became one of five American artists to receive a Kennedy Center Honor, and later that year she was inducted into the National Woman’s Hall of Fame. Maria’s startling energy and passion for dance helped to shape modern American ballet, and her pride in her Osage heritage made her a true pioneer. Whatever Happened to Silver Lake? Today many visitors come to De Smet, South Dakota, hoping to see the Silver Lake that Laura Ingalls Wilder described in her fifth children’s book, By the Shores of Silver Lake. “The lake shore went lower and lower toward the Big Slough, until really there was no shore. The lake melted into the slough, making small ponds surrounded by the harsh, rank slough grass that stood five and six feet tall. Little ponds glimmered between the grasses and on the water the wild birds were thick” (By the Shores of Silver Lake, 77). Wilder made Silver Lake sound like a wonderful place to be! Any Little House fan knows their trip to De Smet would not be complete without seeing Silver Lake. Unfortunately, Silver Lake no longer exists today or at least not the Silver Lake that Laura knew and loved. In the early 1920’s Silver Lake was drained with the hopes of turning the land into farm land. The De Smet News described the plan in 1923. The News stated they intended to “turn the wet marsh into hay and pasture land” and in addition, to ensure that the nearby roadways were able to be driven if the lake was flooded (“Extensive Ditching”). The last picture we have of Silver Lake before it was drained is from 1914 and on the back of the picture it stated that Silver Lake was drained into Lake Henry in order to keep the water from washing over the railroad tracks (LORE 27,2). Between the 1930’s – 1980’s the lake never recollected water (Pioneer Girl 159). However, starting in the mid-1980’s Silver Lake’s bed started to fill with water after large rainfalls. In June of 1984, Silver Lake was filled once again. That year in the month of June alone De Smet received 11.92 inches of rain. By the end of October that year De Smet had received 34.47 inches of rain which is over 10 inches above the annual average (LORE 10,2). Again, in the spring of 1986 Silver Lake flooded again due to the amount of snow from the winter. With that amount of snow it even created a problem for planting crops (LORE 12,1). Ever since 1986, Silver Lake and the Big Slough have never been dry enough to use as farm land. Today, the land is a thriving wetlands area. Visitors can see the Silver Lake Vista off of Highway 14 as they come east into De Smet. At that pull-off what you are actually looking at is the Big Slough and then behind it is where Silver Lake was located. Silver Lake as seen today. For readers that want to stay in a world connected to Laura, there are four different series they should check out. Each one describes the childhood of a woman in Laura’s life: her mother, Caroline, grandmother Charlotte, great-grandmother Martha, and daughter Rose. Drawing on historical knowledge and letters between the Quiner women, the authors have brought the very different worlds and time periods of these women to life. These books are now out of print, but with a little sleuthing you can find them on sites like Amazon or Thriftbooks. If you can find them, it is definitely worth it for a glimpse into the lives of the pioneer women in Laura’s family.